It's been such a beautiful week here weather-wise (downright bizarre for March if you really want the truth!) that I wanted to match it with something equally bright and delightful. 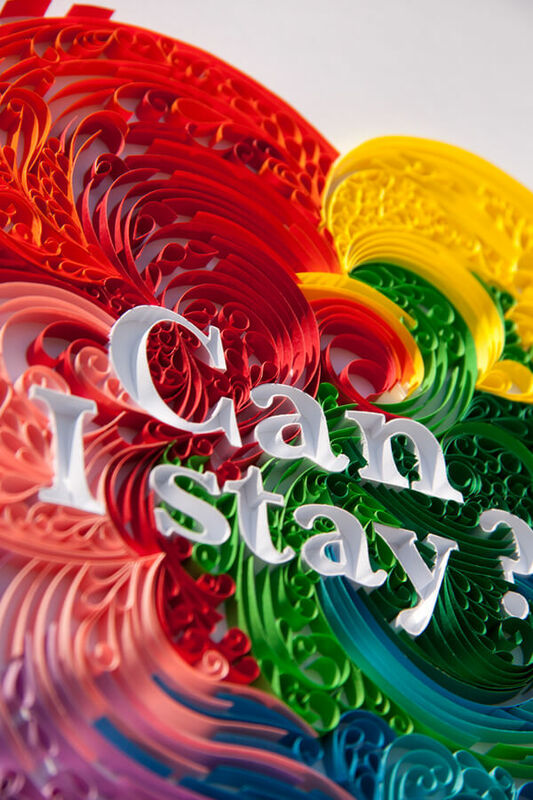 Lavanya Naidoo's recent project titled, "Can I Stay?" fills the bill. You might remember a previous feature about Lavanya and her superb quilling and design skills. She told me this particular piece was created as part of a portfolio package sent to design agencies in Cape Town, South Africa. Vanna was in the process of moving there and in need of employment. The package held her resume, portfolio, and an A2 poster (roughly 17 x 24 inches - big!) of the 'Can I Stay?' artwork. Needless to say, it led to interviews... what firm could overlook the person who asked such an eye-catching question?! Allow me to add one extra pic this Fab Friday... I've been reading up on photography while coming to grips with a new camera. One technique for taking excellent close shots is the use of a large sheet of white poster board to create a seamless background... essential when taking those effective angled shots and exactly what Vanna has done here. I hope your weekend will be a good one! Argh! Your posts like this ALWAYS makes me want to quill and I just don't have the time! So beautiful though! Lovely splash of colours , truly fabulous!! Those are the true quilling artists! Working real hard,taking time to make pieces of art! They have the skills but also,they have art studies and that's the difference no matter what the others do. That is a treat to the eyes. Lovely work. Thanks for sharing. I'm glad you all enjoyed seeing Vanna's work. Lauren, everyone feels that way in the beginning! Like anything, quilling takes practice. Your fingers need to get used to how much pressure to put on the paper and tool - you'll figure it out, trust me. As for the arcs, use paper that is heavier than ordinary quilling paper - try a lightweight cardstock. Work with a light touch and run the strip across your tool ot between your fingers at first to gently break the fibers and give it some curve. Lynn, welcome! I'm glad you enjoy visiting here and thanks very much for adding my link to your lovely blog. I never get tired of crisp text surrounded by big colorful paper swirls. So pretty! Breathtaking color placement! Your posts always inspire me and I thank you! This is beautiful, I hope she got the job! Me too, Lenoria, fingers are crossed!